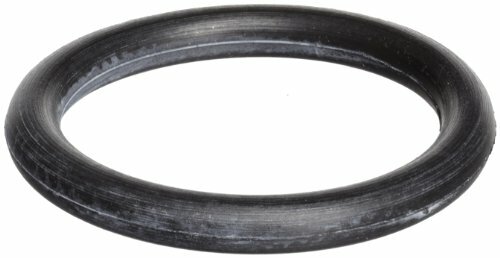 This Viton O-ring is black in color, round in shape, has a durometer (hardness) of 75A, and is designed for use in a wide variety of sealing applications. Viton has excellent heat, fuel, and chemical resistance. Viton is acceptable for temperature applications between -15 degrees F (-26 degrees C) to 400 degrees F (205 degrees C). It is compatible for use with non-flammable hydraulic fuels, silicone oil, chlorinated hydrocarbons (trichlorethylene), fuels, aromatic hydrocarbons (benzene) and aliphatic hydrocarbons (propane), as well as high vacuum environments, ozone, and weathering. Viton is vulnerable to low molecular organic acids, ammonia gas, alkalis, amines, glycol-based brake fluids, and super-heated steam. This Viton O-ring has a shore durometer of 75A. Shore durometer is the hardness of a material, and its resistance to permanent indentation. A higher durometer value indicates greater resistance to indentation on a scale of 0 to 100, with 100 indicating no indentation. O-rings commonly provide a pressure and fluid seal between cylindrically shaped, overlapping mating surfaces and are commonly seen in engines, faucets, flanges, valves and various cylinders. They are circular in shape, with a round cross section and a hole in the center, similar to a doughnut. O-rings are available in various sizes, and can be ordered based on required nominal inside diameter (ID), outer diameter (OD), and cross-sectional (CS) diameter. This Viton O-ring meets standards defined by Aerospace Standard AS568A, which is the Aerospace Size Standard for O-rings.